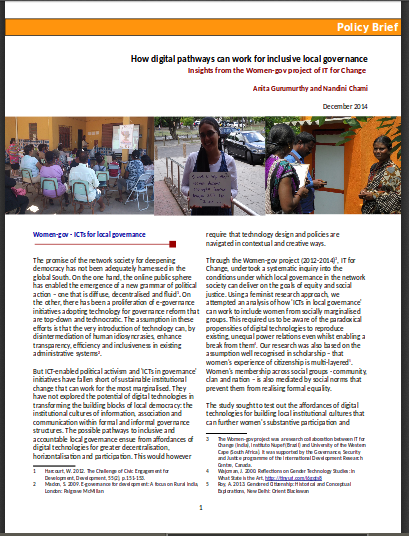 This policy brief brings together key insights on the potential of digital technologies in enhancing marginalised women's active citizenship, from the 3 project sites in India, Brazil and South Africa. This is the final research report from the India component of the Women-gov action-research project. 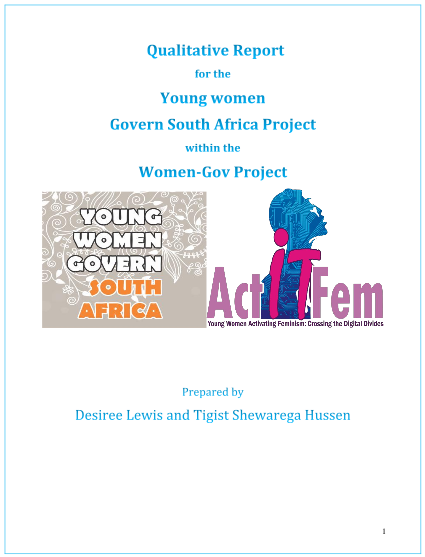 This is the final research report from the South Africa component of the Women-gov action-research project. 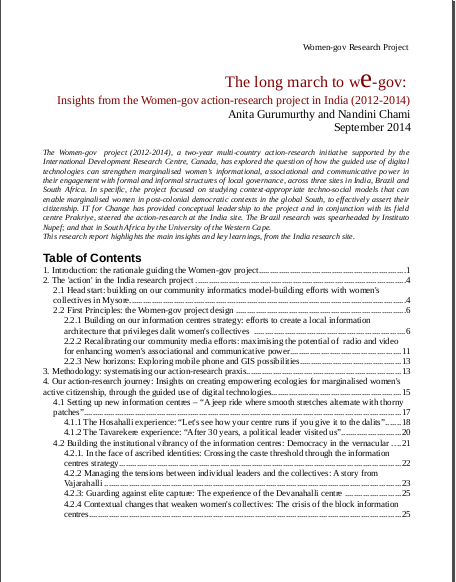 This draft research report prepared in September 2014, highlights the key insights from the India component of the Women-gov action-research project. 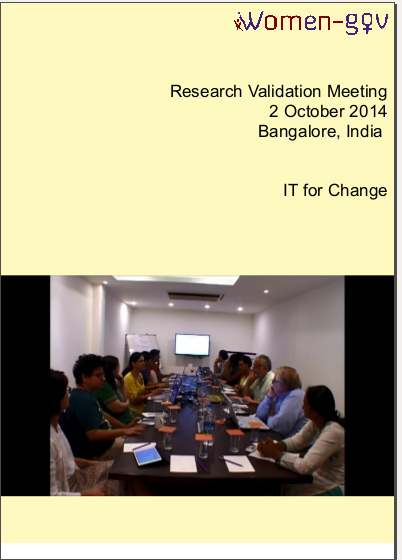 This report describes the presentations and discussions at the Research Validation Meeting of the Women-gov project, convened by IT for Change in Bangalore, on 02 October 2014. 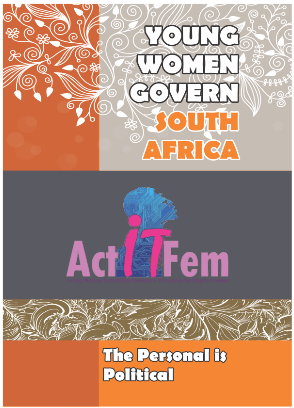 An interim overview of the 'Women-gov' project that briefly outlines the intervention strategies adopted by each of the three project sites: Brazil, India and South Africa, and the impacts of the same. At the Interim Research Meeting that was held in IT for Change, Bengaluru in February 2014, the preliminary research analysis from each of the three sites of the Women-Gov action-research project was shared and discussed. 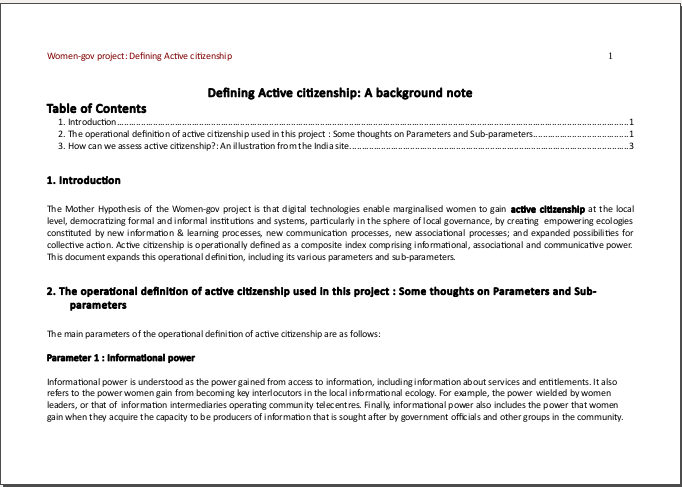 This document discusses the operational definition of active citizenship that has informed the Women-gov project, with illustrations from the India site. In this document, we discuss some of our experiences in the field, as part of the Women-gov action research project (Mysore, India). In specific, we reflect upon those conversations and experiences that raise some issues for reflection, around the information centres component of our project strategy. To break down doors or to unlock them? Drawing upon conversations from the women of the Mahila Samakhya collectives who are part of the India Women-gov project, this note reflects upon the need to examine the question of political subjectivity within and beyond conventional citizenship frameworks. We understood, in the first months of the Yalodês project, that the most pressing need in terms of qualifying and improving black women's collective participation in local governance is to strengthen and amplify the women's voices, especially aiming for the better recognition of these leaders as legitimate political actors, improving the quality of their participation in the local governance structures and processes. This document details our reflections on strategies for amplifying women's political voice.